‘Steve McQueen’ at the Schaulager, Basel was a major survey exhibition of nearly all the artist’s work in moving image installations from the 1990s until now. Several installations were freshly reconfigured in different ways to their previous incarnations, making full use of the Schaulager’s capacious exhibition spaces designed by Herzog and de Meuron architects. On the exterior of the building, Caribs Leap (2002) played on two giant LED screens high above either side of the entrance. Inside, Western Deep (2002) and Gravesend (2007), the two works based on mines in sub-Saharan Africa were installed at basement level in the depths of the Schaulager. Entering on the upper level of the gallery, through darkened glass, swinging doors, gallery visitors found themselves in a long, carpeted foyer space with views of both the Schaulager’s split levels and the outside world. At this epicentre of the building, the film installation Static (2009) acted as a gateway into the rest of the exhibition. The seven minute film, shot on 35mm film, transferred to HD video was projected in a continuous loop onto a two-sided screen suspended within the space. 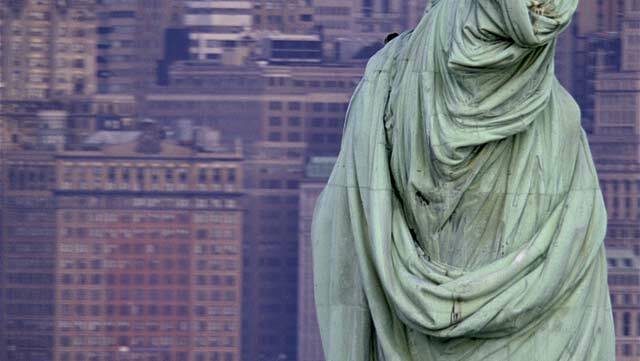 Static focuses on the head of the Statue of Liberty, viewed by a circling camera, moving in a counter clockwise torque around the statue to the urgent sound of helicopter blades. Once more McQueen brings the viewer into contact with somewhere they would not normally find themselves. Filmed at different times of day, the statue is shown to oscillate alternately between a radiant symbol of the American empire, bathed in the glow of the sun and a more shadowy, decrepit artefact. The camera records its weathered patina and the accumulated bird droppings in the copper drapery. Tension builds up and is dissipated as the helicopter, with all its overtones of military and cinematic might, fades to the neutral sound of wind blowing and the camera hovers to a brief resting position before the loop begins again. As Chrissie Iles notes, the image of the statue has its counterpart in another female torch bearer – the former logo of Columbia Studios, emblem of the beleaguered institution of cinema. In its visceral materiality Static re-enacts a trope of cinema: the desire to animate the inanimate, recalling the scene from Roberto Rossellini’s Viaggio in Italia (Italy/France 1953) where the camera attempts to breathe life and movement into marble statues in a Naples museum. McQueen’s cinematic loop literally charges the Statue of Liberty bringing it from a static shell to its full chimeric potential as a universal symbol of human rights and conversely emptying it out again as the loop repeats. In this installation, McQueen’s characteristic concerns come together: the desire to engage the viewer perceptually, an oblique commentary on the politics of representation and an approach to film-making that occupies a position in between the narratives of artists’ films and the broader narrative of cinema history. In its exhilaratingly airy installation, Static continues contemporary art’s reinvention of the classical dark space of cinema within a gallery space. Continuing into the exhibition, a triad of some of McQueen’s earliest works: Bear (1993), Five Easy Pieces (1995) and Just Above My Head (1996) were projected onto three sides of an enormous triangular support structure, described as “leaning against each other” by the artist. This made for an entirely new viewing experience of these works, which have previously been shown in enclosed ‘black box’ spaces. In the 1990s McQueen’s installations were severely darkened, relatively small spaces with no seating, typically measuring seven metres long, four metres wide and three metres high. His video projections filled the end wall of these spaces entirely, from floor to ceiling, creating a ‘blanket effect’. In the Schaulager only Deadpan (1997) was shown in this type of intense black box installation. The more open plan installation of Bear and its companions was positioned off-centre within the exhibition space, while each screen could be viewed from adjacent benches in a further relaxation of McQueen’s former specifications. These three works were shot in black and white 16mm, transferred to video and are exhibited as continuous loop projections without sound. Notably, the Schaulager installation used older format CRT projectors because they produce a richer black and white image. Although freestanding and removed from the intensity of their earlier black box installations, the three films nonetheless retain their physicality and confrontational edge. In Bear, projected at gargantuan height, two naked black men, one of whom is the artist, grapple with each other and at times invade the perceptual space of the viewer. At one point McQueen himself runs forward, lunging at the camera and his shoulder appears to break through the picture plane. Occupying one side of the triangular wedge, the two figures loom and slide about in silence: illusory phantoms pinned down by the physical conditions of their projection. We see in them the apparently documentary become monumentalized: the blown up and slowed down images, rendered in classic black and white become shifting signifiers as McQueen toys with representations of himself as a black male, as a performer and with the associative potential of cinema itself. What seems to be a straightforward scenario quickly becomes more enigmatic as the two men eye each other aggressively and also embrace tenderly. While on one level the original film is a record of a performance, it is also forcefully aestheticized. In the absence of sound, the lighting plays a dramatic role. At times the wrestling figures are bleached out by a flaring spotlight which makes their legs appear momentarily white in one sequence, dissolving their identity. The dancing legs are played backwards and most of the movement is slowed down to fifty frames per second, just short of slow motion but slow enough to have a distancing, dream like effect. The flickering mute imagery recalls both the look of early cinema and the proto-cinematic images of Étienne-Jules Marey and Eadweard Muybridge, reminding us of the early use of the camera to capture and tabulate human movement, subordinating the body to the scientific gaze. Grounded in a real encounter, Bear sets in motion a play of illusionistic references from Hollywood fight scenes to Muybridge, to Queer Cinema, raising questions about the motives behind its own representation of these men. Interestingly, McQueen says that he had not originally intended to be one of the two performers in the film. Comparing Bear with contemporary representations of the black body during the AIDS crisis, Okwui Enwezor writes: “While narratives of the black male body and its social crisis found new outlets in exhibitions and museums, McQueen’s work sought to de-realise the documentary and sociological devices that had encircled the black male body”. In Bear McQueen displaces the apparently documentary with the imaginary and the fictional. The viewer is thrown back on their own associations and impressions of what the black body might represent. In this context, the decision to put an image of McQueen, in the guise of a grinning, naked black man from Bear, on the cover of the exhibition booklet, both risks cultural cliché and puts it up to the gallery visitor to see all the implications of appearances. Throughout McQueen’s work, the body is the means by which the cinematic is grounded by the material, both on screen and in the person of the embodied spectator who becomes involved in a physical encounter with the moving image. The gallery viewer is both drawn into the narrative world of the on- screen image and also encouraged to relate to the film by means of spatial co-ordinates. In Five Easy Pieces, three different scenes interlock like a jigsaw puzzle based on gravity. A serious young gymnast is filmed from below as she walks along a tightrope while five men athletically hula-hooping are seen from above in a flattened, aerial shot. These scenes are intercut with two worms-eye views of a single man aggressively hula-hooping at the camera and McQueen himself, standing in white boxer shorts preparing to do something. The narrative is physically structured as a series of movements. The rich black and white aesthetic of the film, the strong, cast shadows and extreme angles are reminiscent of Russian Constructivist photographs by Alexander Rodchenko while the athletic activities could be from Soviet propaganda films showing model citizens. Even the scene where McQueen cheekily urinates onto the camera lens and by extension, the viewer, is subsumed into this formalist aesthetic. In filmic black and white, the pool of bubbling urine, the surface ruptured by the artist’s final spit into it, is safely distanced from actual reality although the viewer is pushed a little as they register what they are seeing and how they have been positioned by the camera. In Just Above My Head the viewer is drawn into a similar sense of spatial displacement, triggered by a visual reversal where they look down at a handheld camera shot looking up at McQueen’s head. Clinging to the bottom frame of the screen, with only his head and shoulders visible, the artist marches in a continuous cycle. While the title references James Baldwin’s novel of the same name, the installation succinctly dramatizes that the screen image of a black man taking a walk is both charged with cultural associations and is also a matter of gravity, a spatial relationship that the viewer becomes aware of, within the projection space. Part of the same generation as Stan Douglas, Pierre Huyghe and Douglas Gordon that draws on the cinematic as a cultural repository and subject-matter, McQueen has avoided some of the charges of ‘parasitic’ appropriation that have been levelled at Huyghe’s and Gordon’s quotations of Hitchcock for instance. McQueen’s cinematic references are grounded in his development of a specific type of cinematic apparatus involving the viewer’s presence and the architecture of the projection space. During the run of the exhibition the Schaulager screened a number of films selected by McQueen which gave an instructive insight into his cinematic sensibility. His choice included Andy Warhol’s Couch (USA 1964), Gillo Pontecorvo’s La Battaglia di Algeri (Italy 1966) and Jean Vigo’s Zéro de conduite (France 1933). Vigo’s film in particular could be seen as a template for McQueen’s aesthetic approach. Made in almost wordless, black and white purity it combines an anarchic disruption of authority with the sheer otherworldliness of cinema exemplified in the scene where the boys appear to float in mid-air during a surreal pillow fight. Glimpses of their naked bodies introduce an unpredictable sensuality into this ostensibly school boy yarn. The disruption of institutional regimentation and a non-naturalistic approach to realism is also a recurring strategy in McQueen’s work both thematically and in his deconstruction of the institutional framing of film within art history and film studies. As McQueen’s earliest critics recognised, these video installations straddle the boundaries between art and cinema. They have an affinity with both the performative, ‘sculptural film’ and video of mainly male American artists like Bruce Nauman, Dan Graham and Richard Serra and also with the aesthetics of early cinema. Like Nauman’s ‘rat run’ corridor works of the late sixties, McQueen brings an aggressive inflection to the viewer’s experience. While Nauman used live video feedback as a sculptural tool and as an element within what we now call an ‘installation’, McQueen directly takes on the cinematic space. In a sense he creates his own cinematic apparatus which deconstructs our expectations of both cinema and ‘artists’ films.’ Invoking the more liberated conditions of spectatorship in early cinema, the viewer is mobilised into a physical, somatic relationship with the projected image. In art historical narratives of the sixties and seventies, physical and materialist approaches to the moving image became aligned with the practitioners of expanded cinema and structuralist film-making who defined themselves in opposition to narrative cinema. However artists of the 1990s like McQueen, Huyghe, Douglas and Gordon began to use both film and video and to engage with the cinema of narrative and illusion. The use of video as a ‘container format’ for older mediums formed the backdrop to the sometimes strained and disassociated relationship between the spheres of the art world and avant-garde film-making or ‘experimental cinema’. What distinguishes McQueen is the way in which he sidesteps these antinomies to create work that draws on both the strategies of materialist, avant-garde film and the narrative illusion of mainstream cinema. On viewing these film installations at a distance of almost two decades, knowing that McQueen has gone on to make feature films like Hunger (United Kingdom/Ireland 2008), Shame (United Kingdom 2011) and the current release Twelve Years a Slave (United States/United Kingdom 2013), one is struck by how McQueen has managed to ‘have it all.’ If McQueen’s art work takes its cue from the ’sculptural film’ of the late sixties and early 1970s it also pushes the boundaries of what can be said to constitute film as a medium. While the proliferation of video installations in the nineties led to what Rosalind Krauss dismissively called the ‘post-medium condition,’ McQueen’s moving images are critically specific. His use of hybrid technology demonstrates that the moving image can be ‘aggregative’ in Krauss’s sense of what constitutes a critical medium because they involve not just the media of film and video but a consideration of spectatorship and cinema itself. George Baker has rethought Benjamin Buchloh’s theory of ‘sculptural film’ through a consideration of what he calls the ‘filmic sculpture’ of Anthony McCall, seeing this work as less a development from one medium to another but a form of transgression around a limit point. Baker has also modified Krauss’s theory of a critical ‘self-differing’ medium in favour of the specificity with which an artist like William Kentridge works between mediums. Similarly, McQueen’s moving image installations occupy a position between cinema and the gallery. Using film remediated through video, McQueen directly engages with a tension between the screen image and the physical space of projection. This tension is a given condition of the work. As the film theorist Catherine Fowler has observed, McQueen’s play on the relationship between on and off- screen space allows him to work across both the physical space of the projection – the ‘off-frame’ and the imaginary off- screen space of the image. In his later work this play between the off-frame and the off-screen is developed further as McQueen addresses complex geo-political realities in distant locations that elude conventional representation. Beginning with Girls, Tricky (2001) McQueen has increasingly used sound as a weapon to bring us to the brink of other worlds. Installed in a small darkened space Girls, Tricky draws the viewer into an intense sound experience as the musician goes through a series of takes in the process of recording an emotional track. A world away from the recording studio, Western Deep begins in disorientating darkness, accompanied by a loud clanging sound of machinery. It is several minutes before a hallucinatory descent comes to an end as we realise the camera is in one of the deepest lift shafts in the world. In Gravesend we see miners extracting a mineral resource with their bare hands to the accompanying screeching sound of metal splitting rock. In Western Deep and Gravesend which were filmed in South Africa and the Democratic Republic of Congo respectively, McQueen brings the viewer into contact with real places but does not supply contextual information. Information is not conveyed through either voice-over or subtitles but is communicated on a perceptual, materialist basis and is also partially withheld from the viewer. What inferences the viewer can make are drawn from the interplay of sound and image. At times in Western Deep, the sound is abruptly withdrawn and the viewer is left with a feeling of sensory handicap. Shot in Super 8, transferred to video, the low resolution, murky imagery is a literal indication of the difficulty of filming in a mine and a visual equivalent for scenes of labour conditions and human existence at the low end of the neoliberal global economy. In Gravesend, shot on 35mm, transferred to HD digital video, the camera uses extreme near focus to zone in on the exquisite precision of the laboratory apparatus while the miners themselves are represented obliquely and in double-exposure dissolves over the rock face and the sunset at the port of Gravesend. McQueen’s restrictive use of seemingly documentary images is akin to the type of ‘documentary fiction’ proposed by Jacques Rancière in relation to Chris Marker’s The Last Bolshevik (France 1993) where the aesthetic power of fiction is brought to bear on historical facts. In line with Rancière’s philosophy of a political aesthetic, McQueen’s work is political in what it attempts to make visible or in indicating the difficulty of representing certain historical and socio-economic realities. This is a line of analysis developed by T. J. Demos who has enlarged upon the socio-economic facts that are merely alluded to in Western Deep and Gravesend. Having gained access to these ‘other’ places on the margins of our mediatized world, McQueen engages the viewer via their senses, articulating a perceptually fraught representational space. In the Basel exhibition, the predominantly white, bourgeois gallery going public of one of the wealthiest countries in the world was brought into contact with some of the normally unseen and unheard ‘other’ sides of global capitalism. End Credits (2012), the most recent work in the exhibition, is a rolling scroll of redacted documents from the FBI file on the singer and activist, Paul Robeson. The texts are read out in voiceover and it would take six hours to complete one cycle of the continuous projection. Confronted with the enormity of material, the viewer gets a glimpse of the incommensurable forces stacked against Robeson. Finally, in Queen and Country (2007-2009), McQueen’s re-imagining of deceased British soldiers, as individuals on postage stamps, remains an on-going project, having yet to receive official sanction from the Ministery of Defence and the Royal Mail. The modesty of the small stamps, housed in oak cabinets, belies the typically subversive scale of the work. Chrissie Iles, ‘Cities of Cinema: How Steve McQueen and His Generation Re-defined the Moving Image’, public lecture presented at the Steve McQueen Symposium, Schaulager, Basel, May 25, 2013). Steve McQueen interviewed by Solveig Nelson in ‘Steve McQueen’, Artforum 51, no. 9 (May 2013): 320–321. Steve McQueen interviewed by Patricia Bickers in “Let’s Get Physical,” Art Monthly no. 202 (December 1996), 2. Steve McQueen interviewed by Adrian Searle, ‘Interview with Steve McQueen’, Schaulager, Basel, May 24, 2013. Okwui Enwezor, ‘From Screen to Space: Projection and Reanimation in the Early Work of Steve McQueen’, in Steve McQueen: Works, exh. cat., Basel: Schaulager, 2013, 20–35. Barry Schwabsky, ‘Art, Film, Video: Separation or Synthesis?’ in Nina Danino and Michael Mazière (eds.) The Undercut Reader: Critical Writings on Artists’ Films and Video, 2. See Robert Storr, ‘Going Places’, 7-18, Michael Newman, ‘McQueen’s Materialism’, 21-32 and Okwui Enwezor, ‘Haptic Visions: The Films of Steve McQueen’ in Steve McQueen, exh. cat., London: ICA, 1999, 37-50. See also Jon Thompson, ‘”It’s the Way You Tell’em:” Narrative Cliché in the Films of Steve McQueen,’ in Steve McQueen, exh. cat., Frankfurt: Portikus, 1997, 5-9. This dominant historical narrative is challenged by Kate Mondloch who emphasizes the references to narrative and illusion in the work of Michael Snow and others in Screens: Viewing Media Installation Art Minneapolis: University of Minnesota Press, 2010. Rosalind E Krauss, “A Voyage on the North Sea”: Art in the Age of the Post-Medium Condition London: Thames & Hudson, 2000. George Baker, “Film Beyond Its Limits,” Grey Room no. 25 (Fall 2006): 92–125. George Baker, “William Kentridge: New Museum of Contemporary Art, New York,” Artforum 40, no. 3 (November 2001): 143. Catherine Fowler, ‘Into the Light: Reconsidering Off-Frame and Off-Screen Space in Gallery Films’, New Review of Film and Television Studies 6, no. 3 (2008): 253–267. Jacques Rancière, Film Fables, New York: Berg, 2006, 158. Jacques Rancière, The Politics of Aesthetics, trans. Gabriel Rockhill, London: Continuum, 2006. See T. J. Demos ‘Moving Images of Globalization’, 21-32 and ‘Indeterminacy and Bare Life in Steve McQueen’s Western Deep’, in The Migrant Image, The Art and Politics of Documentary during Global Crisis, Durham: Duke University Press, 2013, 33-53.